Oak Use in Wine Making? There are many kinds of oak used throughout the world to mature and ferment wines. The two major types are French and American oak wine barrels. Many factors influence the character of wine; the vineyard, skill of winemaker, cooper (who makes the barrels) techniques, type of wood, stave (the strips of wood that make the barrel) thickness, barrel size, toast level, grain, cellar conditions, and amount of time in the oak barrel. 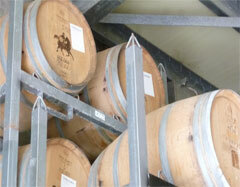 A barrel can be used for winemaking up to about 5 years, when the influence on the taste of wine becomes neutral. Wine is aged in wooden barrels instead of stainless steel tanks to add aroma, flavour and complexity to wine. Oak barrels release compounds into the wine through extraction of characters from the wood. Oak barrels allow oxygen to contact the wine creating a slow oxidation process. In the past, the type of wood used in barrels was dependent on tradition, the variety of wine, economics and personal taste. Oak is used almost exclusively in barrel aging of fine wines because it is strong, workable and lacks undesirable flavours and colours. Its tight grain allows gradual extraction of the wood flavours and minimal wine loss in evaporation. It is resilient and staves can be bent without breaking and has a neutral wood smell. Oak is high in tannin which is an important component in flavour with the correct amount, that allows red wines to age with oxygen which would otherwise over oxidise the wine. French oak comes from forests in Alliers, Limousin, Troncais, Vosges and Nevers, planted in the days of Napoleon for shipbuilding. Each forest has a different density in the wood which gives a slightly different character to the flavour of the wine. Wine makers typically use a blend of wine barrels from different forests to take advantage of each. American oak can vary within a forest due to growth conditions and age however doesn’t possess such strong regional characters. Oak comes from Eastern USA, from Kentucky, Missouri, Ohio, Oregon and Virginia. Reputation of the Cooper in his ability to make a uniform product each year is more important to the wine maker than which state the oak was grown in. flavour and smell than American oak, which has more aggressive mouth feel, a very distinct aroma and sweet coconut like flavours. French oak barrels feel silkier and fuller in the mouth while American oak is more lightly structured. Coopers successfully minimise the effect of American oaks harsh characters by applying traditional French barrel making techniques. Wine maker Bob Cartwright chooses New French Oak for the Chardonnay, Cabernet and Reserve Shiraz and Reserve Cabernet. The Shiraz has a mix of New French oak, New American oak and some Older French oak. Older French oak barrels are used for Cab Merlot, Sauvignon Blanc and the SBS blend. 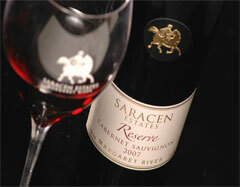 Typically red wines are the wines which benefit most from breathing before serving. However, there are select whites that will also improve with a little air exposure. In general, most wines will improve with as little as 15-20 minutes of air time. However, if the wine is young with high tannin levels, it will need more time to aerate before enjoying. For example, a young Cabernet Sauvignon will likely require around an hour for proper aeration and flavour softening to take place. Not that you cannot drink it as soon as it is opened, but to taste its optimum, give it more time to breathe. Mature wines (8+ years) will benefit most from decanting and then will only have a small window of aeration opportunity before the flavour profiles begin to deteriorate. In general, the more tannins a wine has, the more time it will need to aerate. 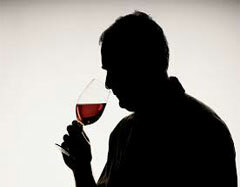 Lighter-bodied red wines (Pinot Noir for example) that have lower tannin levels, will need little if any time to breathe. How to Let Your Wine Breathe? Merely opening a bottle of wine and allowing it to sit for a bit is not enough room/surface area at the top of the bottle to allow adequate amounts of air to make contact with the wine. 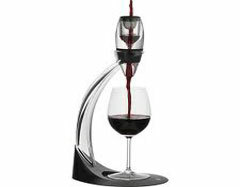 There are now 3 options: use a Decanter or pour into Wine Glasses and let sit, or purchase Aerator. Kiwifruit, Passionfruit, Pepper and Blackcurrant? It isn’t just the way our minds like to describe wine, but there are also chemical compounds found in fruit, vegetables, herbs and spices, that connect us to those descriptives. Sauvignon Blanc is often described as tropical fruit, passionfruit, capsicum and asparagus. Tropical fruit are given their aromas by sulphur containing compounds called Thiols. In Semillon, the smell of fresh cut grass is Hexanol and very grassy is due to high levels of Hexanol. The link between capsicum and asparagus, and cool climate Cab Sav and Sav Blanc aromas, is Isobutyl-methoxypyrazine. For the black peppercorn traits in cool climate Shiraz, you’ll find a compound called Rotundone. Raspberry characteristics in Pinot Noir and Cab Franc, have in common Beta Ionone. Butter and butterscotch in cheese flavour is the Diacetyl found in Chardonnay that’s been barrel fermented. Rose petals, lychees, Turkish Delight! It’s Cis Rose Oxide (a Monoterpene) that is connected with the Gewurztraminer grape. Another Monoterpene, Linalool is found in citrus fruit, flowers and Riesling. Secondary characters like oak matured wines, both red and white, have a vanilla aroma and Vanillin is found in oak wood. Coconut aroma comes from Lactones and oak barrels contain Oak Lactone. Aged white wines can sometimes have a kerosene character from TDN (Trimethyl Dihydronaphthalene) which diesel and kerosene also have similar. The delicious black currant flavour of Cabernet is thanks to (DMS) Dimethylsulfide. So there is more to it than meets the… mind and in the descriptives, that literally are, on the tip of your tongue. 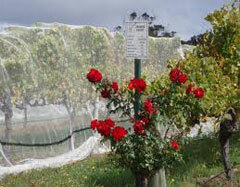 One of the many questions asked is why there is a rose at the end of each vineyard row. Yes they are there to add to the aesthetics and ambience of the vineyard but there are also a few different theories, depending upon who you ask, as to why roses are planted.